What Happens to Inlay Rings When They Get Sized? When I got the email asking if I could do an extreme sizing from 7.75 to 4.5 I knew this would be a challenge! (I refer to any sizing over 2 sizes, as an extreme sizing) Whatever it was, if there were gemstones involved it’d be like a dare. Then I heard channel set and inlay! The gauntlet had been thrown. This was to be a main event extreme sizing. A double whammy of challenging. It’s not like it can’t be done, it’s just that there are certain eggs you’ll break for that omelette, if you know what I mean. 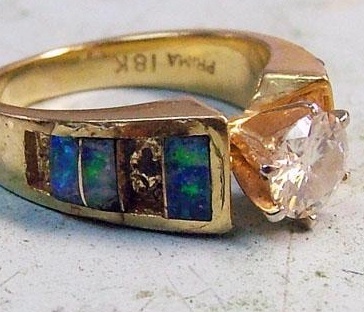 In this blog post I’ll talk about why sizing with inlay gems is so tough. Renee had inherited this diamond and onyx beauty. It was never going to fit her at its current size. No one wanted to touch that sizing job. It needed to be sized. She shipped it across the country to me to see what could be done. Sizing Any Ring More Than Two Sizes is a Risk to Your Gemstones. 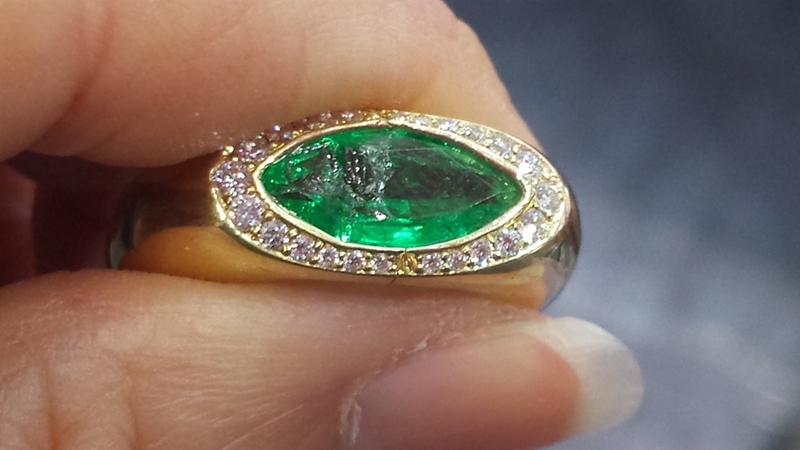 This Emerald Audibly Cracked When we Sawed Through the Gold Preparatory to Sizing. Ouch. I’ve been asked when I size a ring that someone else may say no to why they said no and I said yes. As a designer of jewelry I’ve experienced my share of gemstone breakage. Fun fact, when I make a custom channel set ring and set emeralds, if I need eight stones, I get ten. I assume one or more may break with the stress of setting. Emeralds are soft. See That Opening? It Just Sprang Apart. I do not take the same precautions with diamonds which are much harder. Sizing and especially extreme sizing can put pressure on your gemstones as the circular shape changes. This can cause one or more gemstones to break. I’m sharing a painful example of gemstone breakage with this emerald ring. The plan was to size it one size larger. I didn’t anticipate a problem. However the ring had some tension in it and when we sawed through the gold at the base to start the sizing process, the gold sprung apart. I heard that crack and my heart sunk. This situation illustrates the fact that gems can break even in a simple sizing. I always think of that as the time the emerald exploded. Renee’s black onyx would not survive. Sizing rings with inlay gemstones involves breakage. Once her ring was bent into the new shape as a smaller circle the onyx would break as it cannot bend. The plan was to size first, then custom cut new pieces of onyx and inlay them. Then we had to talk about the baguette and princess cut diamonds. 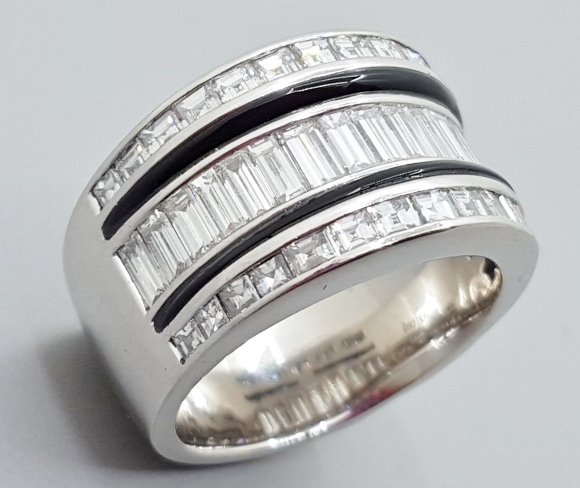 This is a very nicely made ring and the diamonds touch each other in their channels. There was a very good chance that one or more of Renee’s diamonds could chip on their edges. If that occurred, then I’d have to remove the damaged diamonds and set a replacement diamond or two. This could get expensive. However until you get in there, you just don’t know what will happen. Here’s another beauty I was privileged to size. The creativity of some inlay rings makes my jaw drop. When that same ring goes from one owner to another and needs to be sized, that can create a huge problem. This amazing many colored gem ring had top glue-set gems and inlaid lower down the ring gems. I’ve been asked before if we call a stone that is used in inlay a gemstone or a rock. We call it a gemstone. 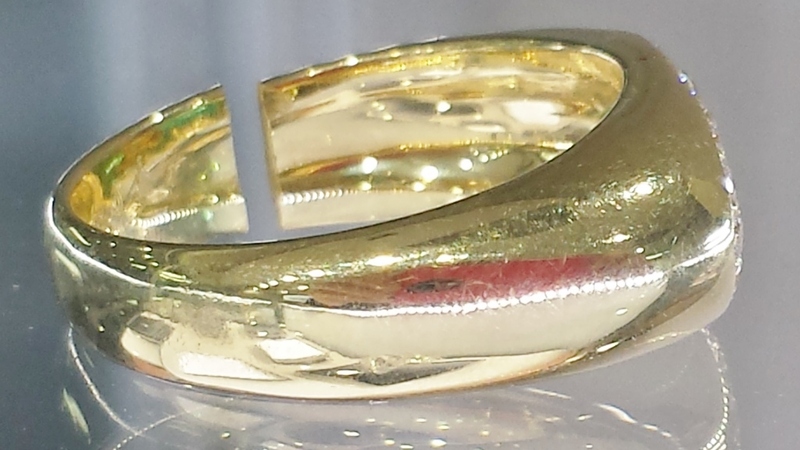 When I was presented with the challenge of sizing this ring larger, I thought the easiest thing to do would be to add a small section of gold instead of inlaying an additional gemstone. My plan was two fold, one, don’t stress the gemstones already in there, and make a raised gold section that would in a small way protect the neighboring gemstones. Since Renee had inherited the ring and not worn it since she received it, for a couple of years, the good news was she’d be able to wear it. And it was a gorgeous, knock me dead, beautiful ring. The workmanship of the well matched diamonds carefully set end to end and touching, in their smooth channels spoke of custom design. When bidding sizing rings with inlay, I bid to replace the inlay gemstone and for doing the sizing only. With the understanding that any other gem breakage will need to be paid for once we see how the ring reacted to the sizing. This lovely well made ring clearly wanted to be worn by her. 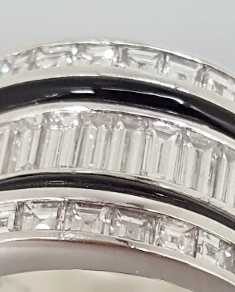 After careful incremental tightening over days into a smaller circle we found that none of the diamonds cracked. Yay! We lasered the ring closed in its new tighter smaller size. Then we measured and had Renee’s new onyx pieces cut. Then set. It was all done. It looked amazing. When Renee received her shipped ring, she loved it and it fit properly, for the first time. This extreme sizing with inlay was massively challenging and very rewarding. What a great story of working a beautiful ring down to the right size. I’m glad no diamonds broke, and that this gorgeous ring can proudly be worn on a much smaller finger!